Celebrate the history of SNK with SNK Arcade Classics Vol. 1 the ultimate collection of arcade classic hits. 16 NeoGeo games on one disc, featuring Art of Fighting, Baseball Stars 2, Burning Fight, Fatal Fury, KOF94, King of the Monsters, Last Resort, Magician Lord, Metal Slug, Neo Turf Masters, Samurai Shodown, Sengoku, Shock Troopers, Super SIdekicks3, Top Hunter, World Heroes. 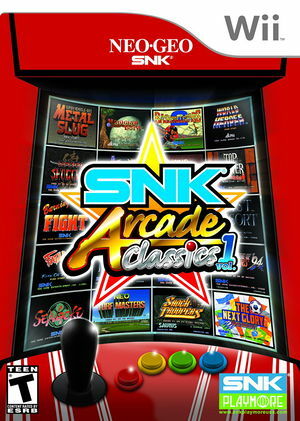 SNK Arcade Classics Vol. 1 is capable of using both GameCube controllers and Wii Remotes. If a physical controller is set to emulate both a GameCube Controller and a Wii Remote concurrently, it will operate both devices at the same time. To fix, migrate controls to use separate physical controllers. The graph below charts the compatibility with SNK Arcade Classics Vol. 1 since Dolphin's 2.0 release, listing revisions only where a compatibility change occurred.